It's Elvis week, when thousands of his fans come to Memphis each year to celebrate his memory. Put yourself in their shoes and imagine this scenario: Suppose you arrive at Graceland only to find it locked up. You are unable to gain entrance, but you can walk around it on a sidewalk and view it from the perimeter. Signage tells you that the Mansion has been closed in order to better preserve it. Instead going inside the mansion, you are redirected to a brand-new museum next door, where you will supposedly find replicas of Graceland's interiors. Only they aren't actually replicas. They are interpretations of what Elvis's home might have looked like if it had been built today, using red steelwork and five, bustier-like "islands". Even though it doesn't really look like Graceland Mansion, you are assured by your guides that it is a "world class" design. After all, it was conceived by some Argentinians, and selected by a jury* from among from many entries. * The jury of seven included only three Memphians: Willie Herenton (a mayor), Diane Dixon (an architect), and Kristi Jernigan (a developer, who has since moved away). This is one of my favorite children's fables, but I did not learn it as a child. I first heard the story in the movie The Crying Game. I believe there are very few people in the world who are truly the essence of evil and might deserve our hatred. There are many people who do things that hurt us, and if it seems intentional (not an accident or mistake), perhaps our natural reaction would be to hate them for it and call them "evil." But that so rarely accomplishes anything. When someone hurts me and I don't know why, I try to think of the following story and consider whether it might apply to the situation. Continues...I am a retired marketing and business development executive. I moved to Memphis in 2003, after having visited here several times during the 1990s. One thing I was impressed with during those visits: I believed that Memphis had a good sense of, and respect for, its own history. I like that in a town. I am originally from another town with plenty of history: Washington, DC. I've also lived in historic capital cities in Europe, the Far East, and our northern neighbor. Imagine my shock and consternation when, only two months after arriving, I attended that infamous riverfront meeting at the ballpark. The Bluff City was planning to replace what remained of its historic bluffs with sidewalks and skyscrapers. 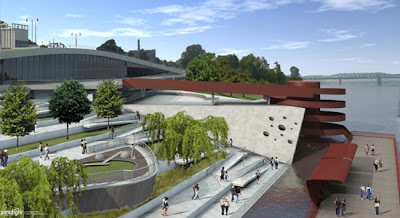 When I took a closer look at the rest of the riverfront plans, my concerns were only magnified. I have since spent many, many hours following the situation and looking under the surface. I've attended more RDC Board meetings than some Memphis celebrities that have actually served on the board. I've spent days in RDC offices looking at documents the public has never seen. I helped a local grassroots organization, Friends for Our Riverfront, establish their Web presence and use technology to further their mission. I can also draw on my years of business experience, including some years as a CPA with clients in commercial real estate. Last year, when I realized that Memphis was about to throw away its greatest cultural landmark, I decided to step forward and speak in my voice. I started this blog. Sadly, after over ten years, the City's riverfront strategy is an epic failure. The trouble is, most Memphians don't even realize it. For reasons that seem to be structural, cultural, and political, Memphians want to and continue to believe in two myths: that developers are always their saviors, and that their riverfront is in capable hands. I hope you will continue reading this blog and learn more of the truth. In future articles, I will explore more deeply some of the myths and realities that have made the Memphis riverfront almost the perfect archetype for what ails Memphis. I want to land my boat on the Cobblestones. Will I be able to do this after the improvements? Let's take a closer look and see if he might already have an answer. Continues...First of all, from my point of view (and that of FfOR and others), he may be asking the wrong question. Here's what I mean. As a boater, he may be concerned only about being able to "land" his own boat. That's a legitimate question, but as a Memphian, my own question is broader: Will the Memphis Queen Lines or other daily excursion cruises be able to land and board passengers for the larger riverboats--the way it has been done for over 150 years? There was another committee meeting last year dealing exclusively with the Cobblestones, and it's worth a read. The RDC's objectives are also pretty clear if you take the trouble to review their Powerpoint presentation from last year. It has never been distributed to the general public (only "stakeholders"), but you can review it at this link, which is also in the sidebar. They've been unwilling to mail out the current version of their plan, but they've told me and others that little has changed..."maybe one or two pictures." Go through those 30 pages from top to bottom. You'll find no mention of any objective to restore and preserve the Cobblestones as a functioning riverboat landing. That's because it wasn't their objective. I listened to the RDC president give this presentation to his board of directors early last year. I listened to him hesitate, hem and haw over this boat dock. It was something "under consideration" but he made it clear that it was in no way certain to be in the final plan. In any event, it would be small and suitable only for canoes and rowboats. Look closely. Do you see a floating boat dock? Nope. Disappeared. Evidently, this is why the RDC says "maybe one or two pictures" are different from the original draft 18 months ago. Now their Web page goes up announcing the public information meeting, and lo and behold a bullet appears (fifth on the list): "Continuation of and improvements to the docking of boats." Did they decide add this bullet (which appears nowhere in their original plan) because they're getting heat from the stakeholder groups? Yes, I believe so. Are they bringing back the little floating boat dock? Very possibly. As a former product marketing executive and a systems engineer, one who has helped bid on many government procurements for computer systems, I understand exactly what this bullet is. We used to call it a "check-off." It's a feature we added (usually with custom software or a third-party gadget) so that we could check off one of the government's requirements so as not to be disqualified. A "check-off" isn't necessarily a useful, or even a usable, feature. It just needs to meet the carefully-parsed government requirement. If the government didn't state their requirement carefully enough, they got what they asked for. No more. Updated, August 12, 2009: What I said above was re-confirmed at the meeting. Continued boat docking merely means that the Memphis Queen II will be allowed to "park" at the Cobblestones area, with utility hookups, when not in use. 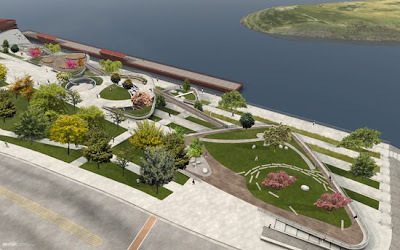 The purpose of the Historic Cobblestone Landing Restoration and Walkway Project is to stabilize and restore the Memphis Cobblestone Landing and provide limited usability, connectivity and accessibility improvements. and presenting a plan that so clearly intends to shut the Cobblestone Landing down after 150 years of continuous use? It will be interesting to see if they are honest about the real reasons, and if they mention this. To put it more bluntly: The City administration has abdicated responsibility for our precious riverfront resource, leaving public policy in the hands of a private corporation whose middle name is "Development", and whose central purpose in life is to build things, whether needed or not. They've long ago gone rogue, and the City Council has so far failed to reign them in. You, the public, are Memphis' last hope. You must reign them in. 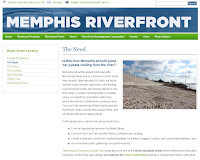 To learn more about the issues with the Cobblestone Landing, Beale Street Landing, and our riverfront, just click some of the important questions in the sidebar at the right. 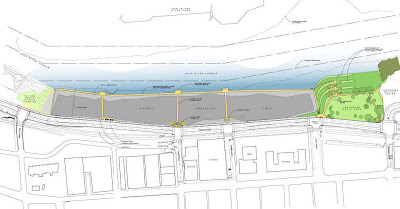 In the earlier article, "The Big Switch: How the riverfront strategy quietly changed," we saw that with the Beale Street Landing (BSL) Project, RDC officials didn't wait very long to veer sharply from the vision and principles stated in the 2002 Riverfront Master Plan. 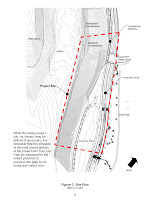 The first clear evidence of the shift appeared in the BSL design competition documents released January 2003--only eight months after the City Council had unanimously approved the Master Plan. In this article, we'll follow the events from that point until January, 2006, when the RDC found itself in an existential predicament. Read on. 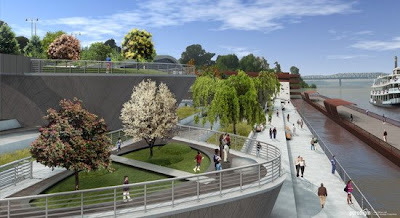 Clearly, their vision for Beale Street Landing was becoming far grander in scope than the Master Plan had envisioned. The competition guide asked for a boat dock that serviced all manner of boats, large and small, not just the big overnight cruisers as the Master Plan had recommended. The guide talked of Beale Street as the center of focus for the riverfront, whereas the Master Plan wanted the focus to be at Union Avenue. The design area allowed in the guide was much larger, and even encroached upon both Tom Lee Park and the historic Cobblestones. Or was it an attempt to keep all options open, just in case the City might change its mind later about the Master Plan? Or was it part of a calculated strategy to re-write the principles of the Master Plan only months after it had been officially adopted? One of the reasons we don't know is because there was no contemporaneous plan for the Cobblestone Landing--and there wouldn't be such a plan until at least five years later. Without seeing a written Cobblestone Landing plan, side-by-side with the BSL design, one couldn't know for certain if the value being added at Beale Street was newly-created--or value taken away from the Cobblestone Landing at Union Avenue. The winning design from Argentina was chosen before the year 2003 ended. Whether you liked the design or not, it certainly measured up to the RDC's exuberance, using every inch of the allowed area, and then some. But it was like a full-busted woman in a too-small bustier: It would require a bit of re-working and refining to tuck it into a manageable package. Meanwhile, in 2004 the RDC went for City Council approval on its new Memphis Promenade Public Realm Plan. 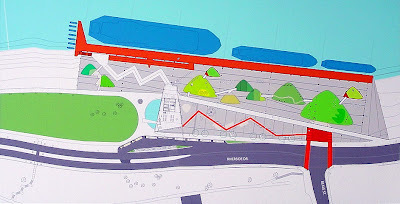 Unlike the Master Plan, however, the "Promenade Plan" (as the RDC likes to inaccurately call it) ran into some stiff resistance from grass-roots citizens groups and others. For one thing, it claimed to remove a "barrier between the city and its river" [Introduction, p.2] by erecting even bigger barriers: skyscrapers. The plan finally passed, with an amendment limiting building heights to 150 feet, but it did not pass unanimously. The RDC may have then begun to sense that, despite all their exuberance, their riverfront strategy would not be a slam dunk. Perhaps also by then the RDC's legal advisers had warned them of another disturbing problem: The Public Promenade land was protected by a conservation easement that had withstood challenge all the way to the Tennessee Supreme Court. The only possible means to take over the public realm and develop it privately would have to be through eminent domain (condemnation). The political will to take such a drastic step might be difficult to come by, especially in the wake of the national backlash to Kelo decision the following year. By 2005, there still wasn't a Cobblestone Landing Plan while the Beale Street Landing design continued to be tucked and tweaked. But even if the RDC didn't yet understand shift in the winds, 2005 would be the year of their reckoning. By then, Citizens groups had studied the Master Plan and had figured out the environmental and economic flaws in that land bridge and lake idea--problems that the RDC's own consultants should have already been telling them privately about. Fracture the city's connection to the “Mighty Mississippi” and turn the Wolf River into an "urban lake." Create yet another center of activity that will compete with those already in place and struggling. One would hope that the Army Corps of Engineers was also doing its job. In its own in-depth study of the land bridge (never released to the public), had the Corps finally told RDC that creating the "urban lake" would probably turn the already-dicey Wolf River into a pollution stew? After a series of public information meetings, culminating in a well-attended, contentious showdown, sponsored by the League of Women Voters, the RDC had to rethink its strategy, In the fall they decided to remove the land bridge (and lake) from the Master Plan. Presumably it would be permanently, but at least it was "out of sight, out of mind." The City Council ratified that decision in January, 2006. The Promenade Plan is on indefinite hold until someone grows the guts to condemn historic public land to give it private developers. "Development" is your middle name--but all you've built so far is a staircase and a roundabout. It's my pretty safe guess that your decision is now set in concrete: With your jobs and reputations at stake, Beale Street Landing must rise from an overly-exuberant sideshow to being the center-ring attraction. Whether needed or not, the red steel boat dock becomes your do-or-die, bet-the-company project--Cobblestone Landing be "dammed" (or put under glass), as it were. These federal funds are specifically earmarked for this project and cannot be reprogrammed. More than half these dollars will be lost by even delaying the project another year. And then a year later, as if your predicament isn't already bad enough: Those overnight riverboat companies start going out of business. You will soon have no customers for this red steel boat dock--unless you move the Memphis Queen Lines off the Cobblestone Landing. Coming soon: The Big Switch, Part 3: The public is hornswoggled. Again. * Including 1999, when RDC was organized as a "steering committee." Question: Why was Memphis put on the map? Why does Memphis even exist? Some of you might believe that the City's founders were thinking, "Hey, wouldn't this be a great place to start a music revolution? Let's put a city here, and in a hundred years or so some blues and rockabilly singers will surely find us and make their homes here, and then produce some music, and then we'll be a famous city! We'll be the Home of the Blues, Rock & Roll, Soul, or all three. Maybe one of them singers will even be named Elvis." Good try, but I'm afraid not. That's not the real reason Memphis was born. I'll give you a little hint. I order electronics parts and gadgets over the Internet. I've finally learned that when I order something, I needn't ask and pay for next-day or two-day delivery, even if I want it in a hurry. I should simply choose ground. Why? Because the part will more than likely arrive in one or two days anyway. Why is that? Because Memphis is a major hub and distribution center. So major, in fact, that a lot of companies put their inventories in warehouses right here, even if the rest of their operation is in California or India. It saves half the trip. And that means, for Memphians like me, the order will never even get on one of those blue airplanes. It will go straight onto a truck from South Memphis to my house. But you know, Memphis didn't get to be a major distribution center just because FedEx came to town. It goes back a long way. Not just back to railroads, but all the way to the beginning of the City. The City's founders realized that here was a perfect spot, sitting high on a bluff and relatively safe from flooding, but still right next to the Mighty Mississippi, to be a great transportation hub and gateway to the west. Commercially, that's was a great thing to be. And so Memphis was born. Where am I going with this? Hang in there. If Memphis' raison d'être was to become a major distribution center, then what is the oldest and most important symbol of that fact? You guessed it: The Great Memphis Landing, all that is left of which today is the stretch that we now call the Cobblestone Landing. But here's the coolest part: It's not just a museum relic. 150 years old (the Cobblestone part) and it's still in use to this very day. Riverboats still land and embark from there--carrying more tourists than cotton of course, but does that really matter? Does that make it less cool? In spite of all its alleged hazards and disrepair, we have probably the best-preserved example of a still-in-service, still-active, still-enjoyed Cobblestone Riverboat Landing in the United States. But not much longer. Some people think it's just a nuisance. Some people think it's ugly, and about only reason to keep it around is that it's on a historic register someplace, so we have to. Some people think we'd all be better off shutting it down and building a shiny new red boat dock to replace it. And some people think that if we really have to be stuck with such a nuisance, we'd best put a sidewalk around the perimeter (with appropriate interpretive signage) so people can stand around it and look at those Cobblestones--if they really want to. And maybe these same people are hoping that after twenty years or so, we'll be so bored with just looking at it, we'll finally move the signs and a few of the Cobbles into an air conditioned museum somewhere--and get rid of the rest of the darn thing altogether. I say, how stupid is that? How stupid that we Memphians, who owe the very existence of our City to that Cobblestone Landing and what it represents, would ever even consider such a thing. For shame! If you agree with me, then right now before you forget put August 11th, 5:30 to 7:30, 330 North Main Street, on your calendar. It may be your last chance to speak up and do your part to help stop some of us from doing something utterly, profoundly stupid. The RDC's Web page tells us, "Sadly, the historic cobblestones have fallen into disrepair as they settled and sloughed at the toe." My initial reaction would be: "Okay, guys. Do what you gotta do. It's your job, anyway. Fix the darn things already. It should have been done decades ago." But I'd still have to wonder: Why are they making such a big deal out of it? Is it really that big a deal? A lawyer friend took the time to scour the District Court records and round up the filings for all those lawsuits. On March 30, 1993, a musician named Michael Harbor fell on the cobblestones and fractured his left leg below his knee. It was 10:30 pm. He had just performed on a riverboat docked on the cobblestones. The case was dismissed after the parties announced that the matter had been settled. On August 15, 1997, 83-year-old Catherine Sullivan took a cab from the Peabody Hotel to the foot of Beale Street where she intended to board the American Queen steamboat. As she walked down the cobblestones to the boat, she slipped and fractured her left ankle. At Baptist Hospital, a plate with screws was attached to her leg. She went through the operation well but suffered a heart attack at 12:25 a.m. on August 16, 1997. She was pronounced dead at 4:20 a.m. that day. The executrix of Sullivan’s estate sued the City of Memphis, the Delta Queen Steamboat Company, and others. On October 29, 2001, the court dismissed the case with prejudice after the parties announced that the matter had been settled. Updated: A reader of this site wrote me with more information. It appears that the first case was settled for 0 (zero) dollars. The second case was settled for $35,000. Certainly, any City facility should be safe and well-maintained (and well lit if it's open at night). That's a given. Other cities maintain whole neighborhoods of cobblestoned streets without complaint. Perhaps it's surprising to me to find only two lawsuits in at least 16 years. For comparison, I wonder how many incidents might have occurred in other City locations in that period. I also wonder this: How many lawsuits might the City be asking for when they open the facility pictured below? It's a question worth asking, but amazingly, it hasn't been asked yet. Photo: Are trial lawyers eagerly waiting for this to be built? 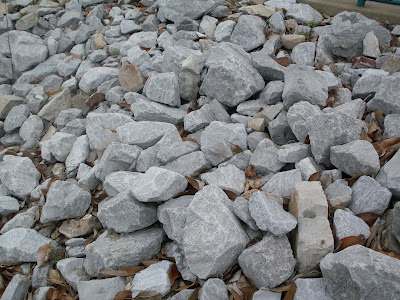 The writer of memphiscobblestones.com insists that the cobblestones are already ADA compliant since "The sidewalk along Riverside Drive provides an incomparable view of the entire length of the Cobblestone Landing -- and that sidewalk isn't going to be under water much of the time, like the one the RDC proposes." That isn't quite the point I was intending to make, because I hadn't finished addressing the ADA [Americans with Disabilities Act] subject. But no matter, I will do so now. The email flurry might have been triggered or encouraged by RDC officials because, as I said, they love to use scare-talk to achieve their purposes. ADA compliance is one of their favorite scare-topics, especially in this instance, as you may soon realize. 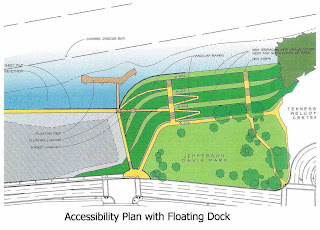 Figure: The sidewalk in question (see arrows above) would be ADA accessible, but would deny all of the use of a historic riverboat landing. Not only that, it would be underwater much of the time. On the other hand, I'd prefer to take the writer's concerns very much at face value, and so I will. The writer raises a legitimate question. ADA is an extremely important subject, a national priority and not merely a requirement in the law. It's a subject that always deserves concern, but often requires some careful thought and study, not just knee-jerk reactions as might be provoked with scare-talk. This is exactly one of those cases, and I welcome the opportunity to explore the issue with you. I absolutely, unequivocally, applaud that sentiment! I am thrilled that someone wants do more than just to "observe" the Cobblestones (with "appropriate interpretive signage"), as the RDC would have us do. The writer sincerely wants to experience them. It is the perfect word and it's right on point with an issue that needs to be thought about by all of us before it's too late. It's the main issue. In fact, I started this web site precisely because I realized a bit over a year ago that the RDC's plans would deny all Memphians, not just those with disabilities, an authentic experience of the Cobblestone Landing. I and others warned the City about this problem, but to no avail. How do people experience the cobblestones today? They go down there by the busloads at around 2:30 pm, descend a ramp, walk across the cobbles, and board a riverboat via a gangplank -- just as it has been done by people and cargo for over 150 years. Since the founding of the City, in fact. Since well before the City got smart and paved the area with quarried cobbles, starting in 1859. That was my first real experience of the Cobblestone Landing. (I'll bet it was yours, too.) I've been there many times since, for photography and other reasons, but I'll always remember my first riverboat trip on the Mississippi, embarking from the one best-preserved examples of a Cobblestone Landing in the USA. But that opportunity to experience the Cobblestone Landing will end in a year, under the proposed plan. So let me say without hesitation: If the problem to be addressed is to enable Americans, both with and without disabilities, the chance to authentically experience the Cobblestone Landing, just as it has been used and experienced continuously for well over 150 years (to this day, even), I welcome that problem with open arms. I want to solve that problem. Let's talk. Surely there's a way to provide ADA access to the excursions without closing the Landing to riverboats, as the current plan would do. Are you hearing my point? You see, the RDC doesn't want to solve that problem. They want to solve the their own problem -- the problem of "those darn boats"*, and they are using you as an excuse and an unwitting ally. 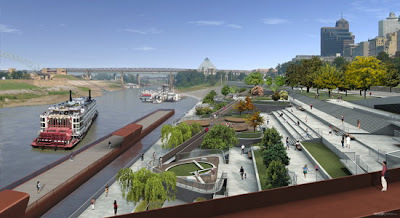 They are proposing to give you and I an alternative experience (cobblestone observer) in a way that denies all of us of the authentic experience of boarding a boat at the Cobblestones and taking a trip up and down the Mississippi. You are slyly being used, therefore, as a justification for decommissioning our great, historic, Cobblestone Landing. I'm sorry, but I have to be brutally honest: Both you and I are being hornswoggled. That is what concerns me. I hope you can applaud my sentiment. I hope you won't allow yourselves to be tricked into supporting this plan. *If you want to learn how the RDC really feels about those darn boats, check out this article from last year's budget hearings (starting at the point when Council Member Boyd takes over the questioning). Listen to the audio I posted there. The RDC doesn't even try to suppress the disdainful sniggering. After that, read and listen to this hearing, which is all about the Cobblestones (with still more sniggering). Cobbles under glass, Part 2: The "Connection"
In my previous article, I neglected to make a point about the so-called "connection" that the RDC wants to build. 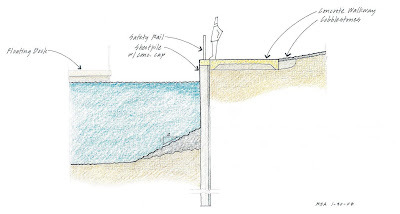 In yesterday's posting, I pointed out that construction of the sidewalk, the rip-rap, and the possible sheetpile walls and/or terraces are not "in a manner respectful of the historical significance" of a cobblestone boat landing. 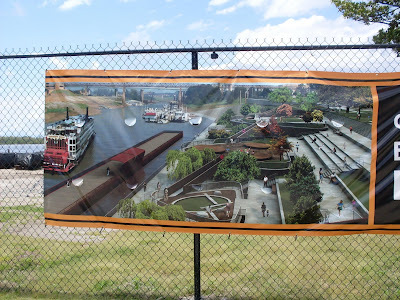 Worse, it will make it impossible to use it as a riverboat landing any more (the RDC would prefer you to use their new red steel boat dock at Beale Street). Furthermore, the reader must surely have figured out by now that if the RDC restored the Cobblestone Landing properly, then there already is a walking surface along the river -- the Cobblestones themselves. After all, other cities proudly let their citizens walk along even older cobblestone-covered streets (and apparently without an inordinate fear of lawsuits). "The Connection" already exists, without the Cobblestone Project. There already is an ADA-compliant, smooth walking surface connecting between Beale Street Landing and Jefferson Davis Park, with a glorious view of the Cobblestone Landing: the sidewalk along Riverside Drive. The ironic part is that the sidewalk was probably built with money the State of Tennessee gave the City in 1997 to (among other things) restore the Cobblestone Landing. The City didn't complete everything they promised the State back then. The RDC needs to finish the job. Coming up next: Another look at ADA. As I said in an earlier article, the problem can be viewed in fairly simple terms: The RDC proposes a plan that was designed to meet the wrong objective. Their objective was to decommission the Cobblestone Landing, moving all riverboats to the Beale Street Boat Dock. They would repair and restore the Cobblestones themselves, but merely as a museum relic, to be seen but not used. The plan is directly contrary to what was stated in the Riverfront Master Plan. Until the RDC is forced to follow the principles and objectives of their own Master Plan, it is probably an exercise in futility to argue about the details of the current plan. Those design details are wrong simply because the design objective was wrong. Only a hard reset of the design objective (and of course a redesign to the proper objective) can really address the plan's multitude of problems. Nevertheless, it is worth taking a closer look at some of the major design elements. In so doing, you might better understand how fundamentally flawed the concept actually is. Let's look at some pictures. Above is the proposed design, as published on the RDC Web site. The Cobblestone Landing area is gray. Along its lower edge is Riverside Drive. The upper edge, in blue, is the harbor. At the very left (south) is Beale Street. At the right (north) is Jefferson Davis Park. Look closely and you will see some yellow strips. Those are the proposed sidewalks. When you include the existing walk along Riverside Drive (not in yellow), you see that sidewalks completely wrap the Cobblestone Landing area -- as if they were acting as a guide rope surrounding and protecting a museum exhibit. Perhaps you can now understand why I call this concept "cobbles under glass". The sense you would have, as a visitor, is that you should walk along the perimeter of the Cobblestone area and observe...but not touch. But it's even worse. As you stand at the border and observe the "cobblestone field" (as they call it), you are being misled. Why? Because no authentic cobblestone landing -- not this one nor any other -- ever had to have special sidewalks built around or through it. The cobblestones themselves (properly maintained, of course) are the intended place to walk. Those sidewalks make sense only if this is intended as an exhibit of "cobbles." It doesn't make sense if it is supposed to portray an actual cobblestone riverboat landing -- much less an active one. Of course, as I have already said, that was their real objective. 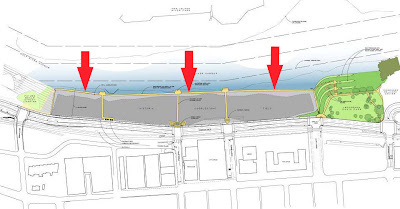 If this was still going to be a riverboat landing, you might expect to find people and boats actually using it -- and the RDC doesn't want that. They want to decommission the Cobblestone Landing and move all traffic to the Beale Street Boat Dock next door, leaving only "cobbles under glass." But it gets even worse. Take a third look and notice the longer sidewalk I've marked with red arrows. That is where this plan goes from being misguided (at best) to downright silliness. With a casual glance, it would appear that this sidewalk follows the harbor's edge. "Access to the river," the RDC likes to say. That sounds sensible, right? Remember that the Mississippi River's level varies up to 30 feet in a typical year, and it varies up to 50 feet at the multi-year extremes. Remember, too, that the Cobblestone Landing was designed to accommodate this basic Mississippi fact of life, which is why it is on a gentle slope. No matter what level the river reaches, up or down, the Landing always has the same physical presentation to the riverboats. How many days during the year do you suppose the water's level will reach, even approximately, to where that sidewalk is? I don't know, but let's be generous and say one-third of the time. This means that the sidewalk will actually be under water and unusable another third of the time. And the remaining third? The person standing at the sidewalk will be looking out over...not water, but a field of rip-rap! Between the rip-rap and that nonsensical sidewalk, it is abundantly clear that RDC has no intention of the Cobblestone area being a safe and secure place for pleasure boats or the excursion riverboats that use it now, much less an authentic Landing as it has been for 150-plus years. If the proposed plan is implemented, the decommissioning of the great Cobblestone Landing will effectively become permanent. That's why you, the public, need to speak now, or forever hold your peace. Why are some Memphians afraid of our heritage?